One day after a newly sworn in Turkish president Erdogan, now with sweeping executive powers, shocked investors and sent the lira plunging when he unveiled a new cabinet that featured his son in law Berat Albayrak as the country's new Minister of Finance and Treasury while excluding the current Deputy Prime Minister Mehmet Simsek, who was the only market-friendly official and the de facto economic czar, overnight Erdogan completed his sweep of undisputed economic control with a presidential decree which granted the president the power to appoint the central bank governor, deputies and monetary policy committee members for a 4-year period. Three presidential decrees, published in the country’s Official Gazette, set out the structure of the new presidential system and the regulations governing the appointment of officials by the president. They replace the existing framework according to which there was a five-year term for the central bank head, however the decree scrapped this stipulation as well as a requirement that deputy governors have a decade of experience. The announcements deepened worries about the bank’s independence and triggered near record losses in the lira, which has been hit this year by concerns about Erdogan’s drive for greater control over monetary policy. 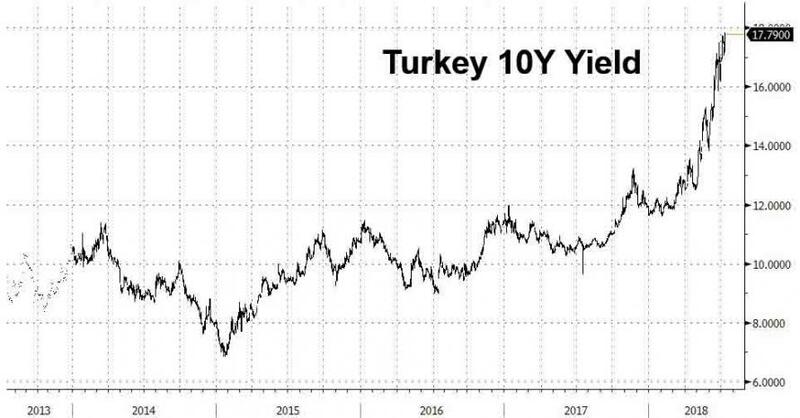 Investors were spooked by Erdogan - a self-described "enemy of interest rates" - and sold off Turkish assets on concerns that his push for cheaper borrowing costs will mean he will look to take greater control of monetary policy under the new system, unleashing even higher inflation and sending the lira soaring. 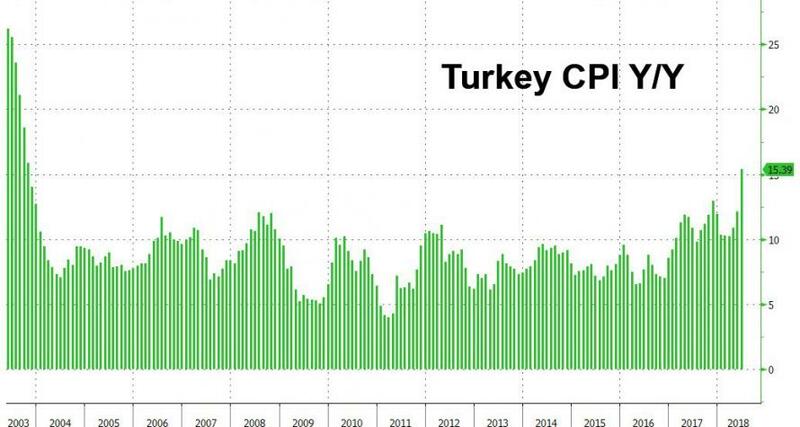 As a reminder, on Monday Erdogan was sworn for a five-year term as president with enhanced powers after winning re-election under an amended constitution, setting the stage for him to follow through on a pre-vote promise to take more direct control over monetary policy. The 64-year-old leader has repeatedly clashed with the central bank over borrowing costs that he is determined to keep low under almost all circumstances. It is however, not very important to Erdogan. Meanwhile, amid all the chaos, Bloomberg notes that it is no longer clear how the central bank will respond to further inflation gains, which just a few days ago printed at the highest since 2003, and was running more than triple the official target at its next monetary policy meeting on July 24. “Key is independence from influence and ability to do what is needed. Given the tough decisions needed to be taken, with the new cabinet and changes with decrees, that ability may have been impaired, especially on increasing interest rates to control inflation,” said Verda Partner portfolio manager Michel Danechi. 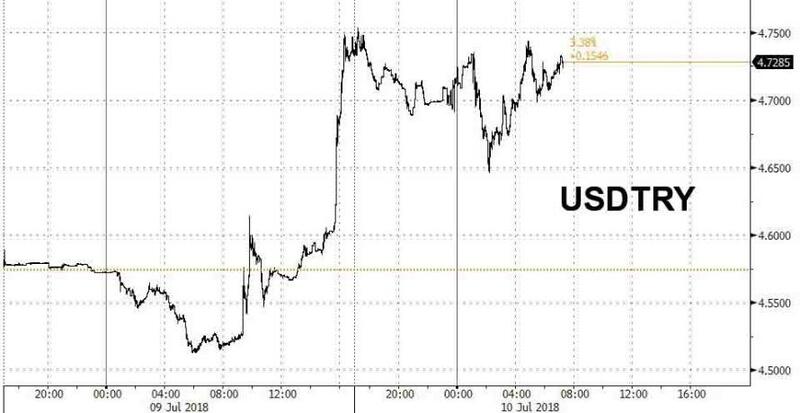 ...after it had recouped much of yesterday's losses, as it becomes clear to investors that Erdogan no longer cares about the viability of the overall economy, and instead plans on making its his own family fiefdom, no matter the cost. Meanwhile, confirming which way the currency crisis winds are blowing, the Turkish 10Y yield just jumped to a new all time high.